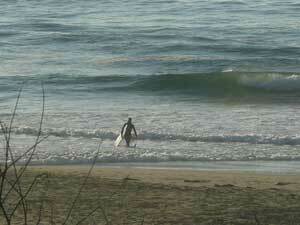 For those of us who love the water, there is nothing more engaging than a surfer at play. The way they harness the force of the ocean, riding the waves becomes a dance with the ocean itself. Each wave is unique, each moment an active metaphor for what it is to be a human in deep conversation with the earth’s essential element, water. 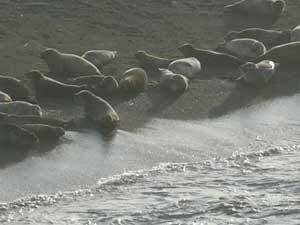 There is something primal and awe-inspiring in their ability to become a part of the moving landscape. They playfully emulate natural spirals, and artfully carve shapes into both the great moving canvas of the Pacific, and into our collective cultural imagination. For years now, as an avid swimmer and child of the Left Coast, I have been fascinated with the water benders we call surfers. 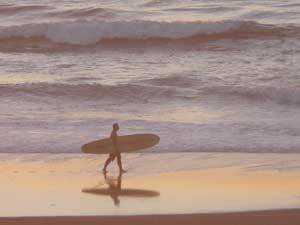 I’ve watched and photographed them in Santa Cruz, but even though I grew up here (and swam in the Laguna at Salmon Creek as a kid), it never occurred to me that people were surfing our beaches. It was a So Cal thing. Right? After all, as children we had been warned from swimming in our native water for some pretty good reasons: undertows, rip currents, sleeper waves, rocks… it was just too cold and sharky! 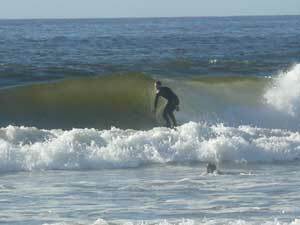 I am glad to know that I was wrong; the words “surfing” and “Bodega” do go hand and hand. Sarah Molica, owner of the Northern Light Surf Shop, in the town of Bodega schooled me in the history, culture and practice of surfing in the area, and opened my eyes to a whole new way of looking at our local coast. We went to elementary school together, and to me, Sarah is the definition of success…she is happy in her life and does what she loves for a living. Although the pace might seem slow to some, sitting out front of the shop, sharing a beer and conversation with locals, helping customers that wander in, and returning to the porch to talk and wave back at the people in cars who smile and wave their greetings to her…it seems so good, so “just right.” It is clear that this little surf shop and the people in it (Sarah, her boyfriend, Ben Dougherty, and co-owner/dog/child; they have two shop dogs: a 90lb german Shepard named Lexie, and a smaller shop dog named Bug) are at the hub of a very happy, relaxed, and kind community of people who love the water. To better understand her connection to the local history and her love of the sport, I asked Sarah how long she has been surfing. She started by body boarding, then she tried to stand up (she is not sure which one of her crew of friends got up first), then she got to short board. 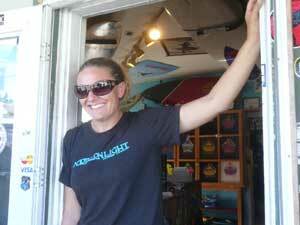 To be sure, Sarah’s story of surfing and her connection to the shop is one of friends. “In high school we were all cutting class. They would say: ‘Oh, man I’ve got to get out there, the conditions are perfect.’” Laughing in the sunlight and looking like the picture of health and beauty, she told me how she would use her yearbook pass to get her friends out of class and go surfing throughout high school! If necessary, she would say the pictures didn’t come out so they would have to take them again. Apparently, they never got in trouble as it “was a legitimate excuse…then I had camera out there, so I could take pictures all day” (something I can really appreciate). Sarah shared with me the history of the store. The Northern Light Surf Shop started out in Tamales, then moved to Bodega (in the building that’s now The Birds museum around the corner). The original owner was Steve Quartz, then Don Martin (who moved it to Bodega). As a teenager Sarah used to hang out there with her friends (Nick Marlow, Ben Hakala, Able Damkoehler, and Jakla Jonpular). The boys worked in the shop and she “worked there some – helping them out. They’d be asleep on board bags beneath the wetsuits.” Rather than going to college, Nick and Able and Ben pooled their money to buy the surf shop. They co-owned it and moved it to its present location. Before settling down, Sarah, spent one year on a surf trip, going around the world, surfing places like Tahiti, Fiji, Hawaii, and New Zealand. 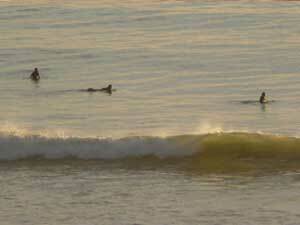 “Most surfers will go on surf trips as often as they can, always looking for the perfect wave or something different. That stereotype is true. We like to travel.” I asked her about her favorite spot, and she said she can’t divulge her favorite local spot, but her all-time favorite spot is in Fiji. “Soso’s a tiny little island in Fiji; no one will ever find it anyway,” she laughed. 1) Do pushups. You will need to push yourself up to standing and will do a lot of paddling, which is hard on your arms. 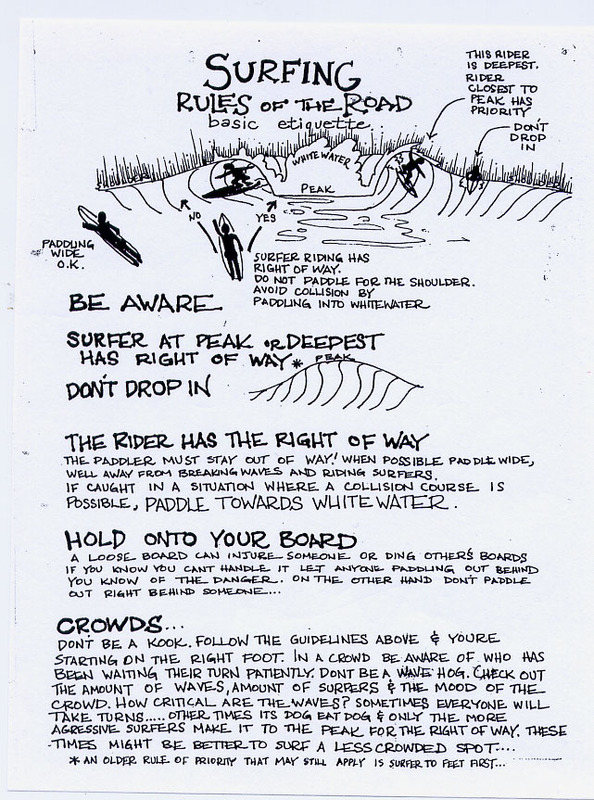 3) When you are in the water, triangulate or line up 2 points on the beach; one close and one farther back to be able to judge your relative position once you find a good area for waves. 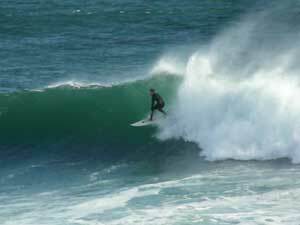 Although I’ve only taken one surf lesson, I highly encourage giving it a try to anyone who loves the water and watching the waves. 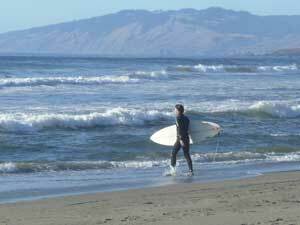 Northern Light offers a free surf update on facebook every day or by phone at 707-876-3110. 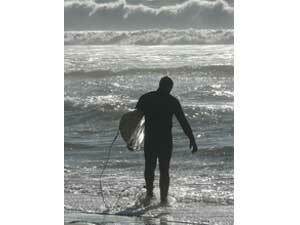 You can take surf lessons from Abel Domkoelher (707-536-7960), or visit for more info check out NorthernLightSurf.com. On a personal note, I want to thank Sarah for reminiscing about school days, and for giving me a glimpse inside local surf culture; adding a richness to my love of the area. I’d like to leave you with a personal anecdote. 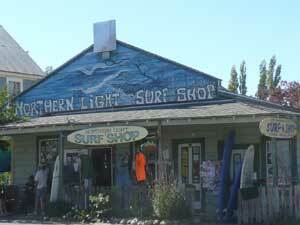 A few years ago on a beach on the North Shore of Oahu, Hawaii, I met a man wearing a Northern Light Surf Shop shirt. I asked him about the shirt and he said he had just moved to the islands from Bodega. It really is a small world. Mahalo. 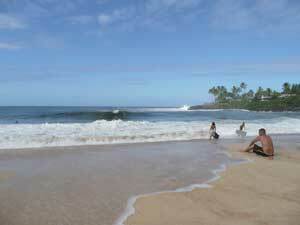 Incredible that Bodega and Hawaii have common surfers. I guess when you share a passion for something, the chances increase that you can find another with yours. Thanks for this great article, Nadja. Nice to read about people who are living their passion. 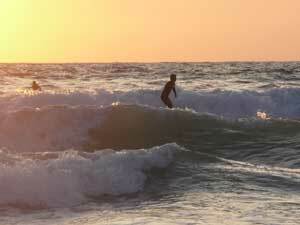 It’s true, once you have the surfing bug, you’re hooked for life.